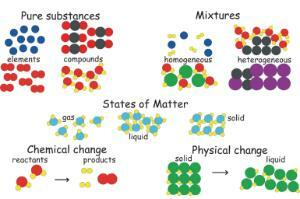 Illustrate dozens of core chemistry concepts with this colorful set of giant magnetic atoms and molecules. Placing the particles on a magnetic board, you can create particle diagrams demonstrating elements, compounds and mixtures, products, reactants, changes in matter, how to balance a chemical reaction, as well as homogeneous and heterogeneous samples of matter. You can also draw beakers on the board and place the magnetic pieces inside to show solid, liquid, and gas states of matter. A great companion to our Atom and Molecules Particle Cling Manipulative, this demonstration provides a comprehensive understanding of chemical reactions through visualization.